A small border town in Russia’s Rostov Region was hit by seven artillery shells on July 13 during fighting between Ukrainian government troops and pro-autonomy militias on the other side of the frontier, killing one and seriously injuring two more. Moscow has blamed the Ukrainian Army and has warned that it will not tolerate further attacks. 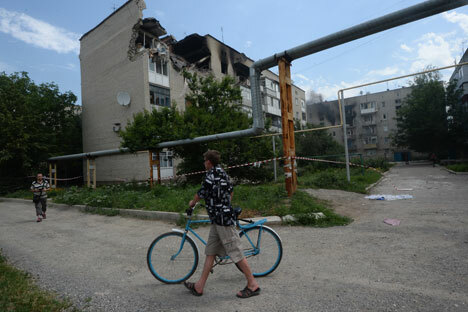 During clashes between Ukrainian government troops and pro-autonomy militias on Sunday July 13, seven artillery shells landed on the territory of the Russian town of Donetsk [not to be confused with the large Ukrainian city – RBTH] on the Ukrainian border. One man was killed and two more people were seriously wounded in the explosion. Russian Federation Council deputy speaker Yevgeny Bushmin has called for considering the possibility of carrying out surgical strikes against targets on Ukrainian territory. "According to our data, of the seven shells that hit Donetsk, six exploded and one did not. Preliminary findings suggest that those were 122 mm artillery shells," a spokesman for the Rostov Region government, Alexander Titov, told the Interfax-South news agency. This is the first death of a Russian national on Russian territory resulting from the armed conflict in Ukraine. Moscow has blamed the incident on the authorities in Kiev, warning that the shelling of Russian territory will have "irreversible" consequences. Russian Deputy Foreign Minister Grigory Karasin says the incident is being investigated and promised a tough and specific response to the death of the Russian national. "Recent events show that there has been a dangerous escalation of tensions on the border. It creates a new quality of danger for our citizens living on Russian territory,” said Karasin. “Therefore our demarches will be tough and specific, but first we need to establish all the circumstances of what happened," he said. At a meeting with German Chancellor Angela Merkel in Rio de Janeiro, Russian President Vladimir Putin stressed the need to resume the work of the contact group on Ukraine as soon as possible. The two leaders agreed that the situation in south-eastern Ukraine was deteriorating. The German side urged Moscow to step up pressure on pro-autonomy militias to end the conflict. The Ukrainian authorities' position on the incident is firm: Kiev had nothing to do with the shelling of the Russian town of Donetsk. "Ukrainian servicemen have never shelled, do not and will not shell the territory of the neighboring state and residential areas. We expect the Russian authorities to be objective and unbiased in their assessments of what caused the tragic incident in the town of Donetsk in the Rostov Region and are ready for cooperation on the investigation into the incident," a statement from the Ukrainian Foreign Ministry said. For their part, the leadership of the self-proclaimed ‘republics’ in Ukraine's southeast blamed the death of the Russian citizen on the authorities in Kiev. "With 90-percent probability, this was done by Ukrainian forces. The thing is that we have a shortage of heavy weapons and shells, while the weaponry that we do have is operated by top-class professionals,” Andrei Purgin, first deputy prime minister of the self-proclaimed Donetsk People's Republic, told Russian news agency Interfax. “There is no way they could have been so off the mark as to hit Russian territory. Whereas the Ukrainians, on the contrary, have lots of heavy weapons and no shortages. So, of course, it was their shell." The influential Russian daily Kommersant, quoting a source in the Kremlin, reported that Moscow is planning to carry out "reciprocal surgical strikes" against the Ukrainian army if shelling of Russian territory continues. A similar position was voiced by Federation Council deputy speaker Yevgeny Bushmin, RIA Novosti news agency said. "It should be done demonstratively. If that was an artillery gun, it should be destroyed. The public should be presented with the fact that any attack on Russia will be thwarted. An adequate targeted response is needed," Bushmin said. The senator, who had for the past two weeks been in the Rostov Region, said: "One gets the impression that, where previously fire was not aimed at Russian border guards, now an increasing number of acts of provocation are being staged, as there is no other way to force us to engage in confrontation with the Ukrainian forces." Bushmin stressed that he meant not a large-scale operation but individual targeted strikes against the positions from where Russian territory was fired upon. However, President Putin's press secretary Dmitry Peskov described the reports that Moscow was planning "surgical strikes" as absurd. "Reports that Russia is considering the possibility of strikes are nonsense and untrue," Peskov told Bloomberg. He added that Russia had ruled out such an eventuality. According to Dmitry Trenin, head of the Carnegie Moscow Center, Russia is unlikely to resort to a full-scale military operation in Ukraine. "Although the tragic incident in the Rostov Region has received a lot of publicity, President Putin's key strategy in Ukraine is unlikely to change," says Trenin. "This strategy consists in implementing Russia's interests without a direct intervention in the Ukrainian conflict, which would result in a complete breakup with the West, especially with Europe," he explains. The pundit believes that Moscow is likely to resort to decisive diplomatic steps, but they are unlikely to be followed by military involvement, including any deployment of Russian peacekeepers in Ukraine.